What Did They Do Instead of Retirement? Essentially, both of these clients were saying that they didn't want to just stop and collect checks and grow old. They enjoyed having a sense of purpose, being productive, and being challenged. In the case of the client who said he was going into "Phase 2," this person had a very different set of projects he wanted to work on. He was building a level of financial independence that would eventually allow him to step away from a lucrative career that was no longer a passion. Instead of retirement, his goal was to move on to something new—something more interesting and fulfilling. In the other case, the client who didn’t want to quit working (and many like him whom I have worked with since) had built a business that he was passionate about. He cared about his employees, customers, and clients and considered that an important part of his life. He worked at structuring the business, its systems, and team to run more and more without him. This allowed him to stay involved and maintain a source of income, while also giving him the freedom to pursue passions that he had not been able to pursue when he was younger and the business was new. Many of the people I've met in this situation don't really need that income and don't live extravagant lives, but they are happy and seem fulfilled. Instead of collecting checks and growing old, design a second phase of your life that is challenging, fulfilling, and enjoyable. I firmly believe in working toward financial independence, and I work diligently on this for myself and my clients. To me, this means having enough money so that you don't have to worry about money. 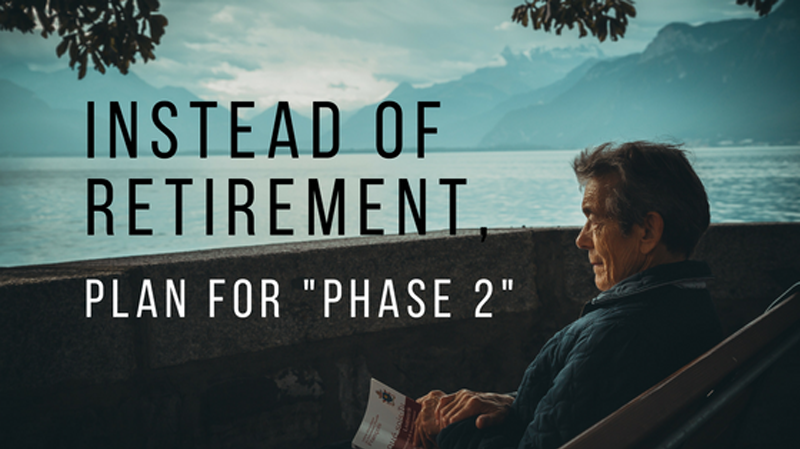 Whether you decide to retire and pursue passion projects or continue working while enjoying free time on the side, the key is to have some sort of “Phase 2” in sight—to retire to something. And to set yourself up financially so that you can have the freedom to pursue your dreams and enjoy your Phase 2. Do You Have a Good Reason to Retire? What could I do that would make me excited to get out bed? What have I always wanted to do or learn that maybe scares me a little? What kind of example do you want to set for your kids and grandkids? Don’t just retire because everyone else is doing it. Retire to something. In an effort to develop and create my own "Phase 2," I have started learning Italian. It was a goal I set over 20 years ago, but now I finally have the time to begin it. When I was younger, I studied German for 8 years and really loved it. I've since realized that I want to be able to spend time learning about the Italian language, culture, and history so I can travel more and spend more time in Italy as I get older. What do you want your Phase 2 to look like? Need help figuring it out? Contact me! I’m happy to help.